Founded by Baha’ad-Din Naqshbandi, the Naqshbandiyya order became the most influential sufi order in today’s Southern Xinjiang by the 15th century. Khoja Afaq was the saint most responsible for establishing the Naqshbandiyya among Chinese speaking Hui Muslims in Northwest China’s Gansu, Qinghai and Ningxia provinces. Khoja Afaq was believed to have traveled to Xining, Lintao and Hezhou (today’s Linxia) and preached to Chinese speaking Hui, Salar and even some Tibetans. He had two great Hui students, one was Ma Laichi and the other was Ma Mingxin, both of them later went to central Asia and performed Hajj and studied Naqshbandi under great Sufi masters in Central Asia and Middle East. Upon their return to China, two most important Naqshbandi orders were established in China: Ma Laichi founded Khufiyya Menhuan order and Ma Mingxin founded Jahriyya Menhuan order among the Chinese speaking Muslim Hui people. These two are the largest sufi orders in China: 10% of Chinese speaking Muslim Hui people are Jahriyya followers and 7.2% of Chinese speaking Muslim Hui people are Khufiyya followers. Ma Laichi founded Khufiyya Menhuan after his return to China from Hajj. The Khuffiya Menhuan he established was named Huasi Menhua which was the core of Khufiyya movement in Chinese Islam. The feature of Huasi Menhuan is its adherents’ emphasis on silent Dhikr (invocation of God’s name), stronger participation in the society, veneration of saints and seeking inspiration at their tombs (Gongbei). Huasi Menhuan requires to recite Dhikr (Zikr) silently in the morning and evening, do voluntary prayers at night. Dhikr is taught to followers in a secret way. The head of Huasi Menhuan is called Taiye who is regarded as a saint and after he dies, a Gongbei will be built on his tomb. Senior members of Huasi Menhuan is named Laorenjia. 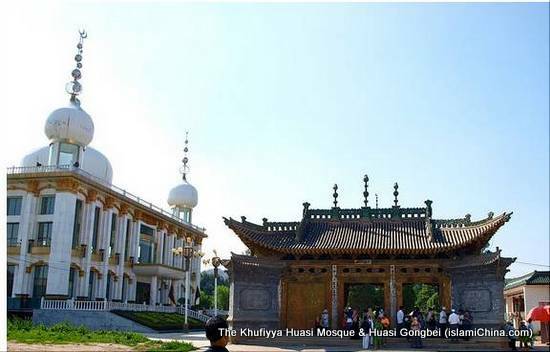 Khufiyya is believed to have 20 branches, scattered in the provinces of Northwest China’s Gansu, Qinghai, Ningxia and Southwest China’s Yunnan and Sichuan Provinces. Distribution: Wayaotou, Bafang, Kangle of Linxia county, Gansu Province. Distribution: Gansu, Qinghai, Ningxia, and Xinjiang.